The Barn on White Run | Salvaging A Gelatin Mold. Not! 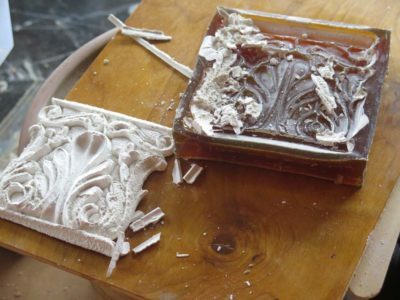 Salvaging A Gelatin Mold. Not! 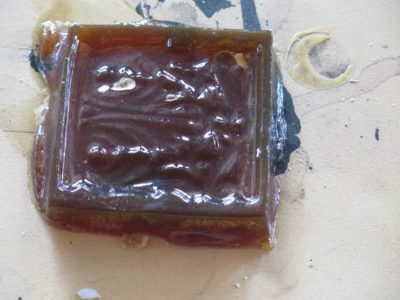 I mentioned earlier the failure of a plaster casting in a gelatin mold when I had to step back from work in the shop for a couple weeks during my vertigo incident (very much improved, only an occasional moment of lightheadedness), and my desire to try to salvage the warped, shrunken and hardened mold. To manipulate and try to regain the utility of the mold I immersed it in hot water to see if that would do the trick. The experiment was both a complete failure and an enlightening success. Yes, the mold being manipulated started dissolving and slumping immediately, with, um, some loss of definition, resulting in it becoming a useless blob of goo. That said it was elucidative of a correct direction in the overall enterprise, and enlightening to the future modifications. The fact that the mold could be manipulated by the hot water was instructive in confirming this strategy for a dried mold. That said it was immediately clear that the proportion of crosslinker in the original formulation was too low, so I will make a new mold with twice as much crosslinking additive. The mold had very little fungal attack so I know I am about at the right place for that additive. So, sometimes ven failures keep you moving in the right direction. 1 Comment on Salvaging A Gelatin Mold. Not! About vertigo, my wife was cured with one session of osteopathy. She was suffering vertigo when lifting her head.